If it is too cold outside while visiting Banff National Park in Alberta, Canada, join the people who jump into the Hot Springs to warm up. People sit on the edge of the pool, rest on the water structure and swim in the pool as the steam rises at the Hot Springs making it almost seem like summer, not winter. 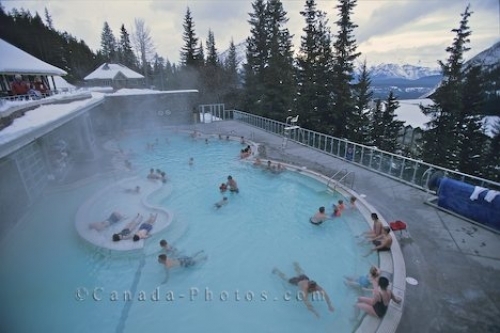 Upper Hot Springs Pool in winter, Banff, Banff National Park, Alberta, Canada, North America. Picture of people enjoying the Hot Springs during the winter season at Banff National Park in Alberta, Canada.